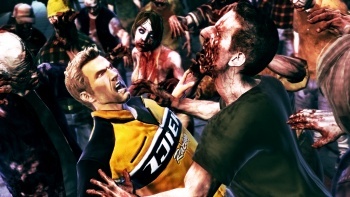 Dead Rising was noted for having hundreds of zombies onscreen at any given moment, but series creator Keiji Inafune says that Dead Rising 2 will have "thousands." If you asked most gamers what they remembered from Dead Rising, they'd probably tell you one of three things: 1.) Frank West has covered wars, y'know; 2.) It's pretty awesome being able to kill zombies with almost anything in the whole mall; 3.) Holy crap there were a lot of zombies to kill! The game was noted for its massive amounts of enemies onscreen at any one time (on the Xbox 360, anyway) - but series mastermind Keiji Inafune says that Dead Rising 2 has topped that in a big way. "In the previous version 500 zombies would appear on screen at the same time. That's an insane number, considering that only about 20 appeared on screen at any given time in Resident Evil," Inafune said in an interview on the Capcom website. "In Dead Rising 2, literally thousands of zombies will appear onscreen at the same time." Even if we take Inafune's "literally thousands" at the lowest possible number - that's multiple thousands, or 2,000 - that's still four times as many zombies as were in the first game. And we already knew that developer Blue Castle was hoping to have a whopping 6,000 on screen at once, making it the game with the most entities on-screen ever. Looks like Chuck Greene is going to have to get creative to deal with those undead, brain-eating multitudes.